Rabbits can be very smart and persistent when it comes to getting what they want, be it food, petting or exercise. Because they are quieter and gentler than other animals, their requests for attention may go unnoticed by the uninitiated observer. Individual bunnies display great inventiveness in finding new ways to get attention, depending on the occasion and the person concerned. Some caregivers have said their rabbits feel a greater need for attention in the mornings and evenings, when they are most active. Other rabbits are always willing to be petted no matter what time of day. One of my rabbits has noticed I have a free hand when I am on the telephone and often follows me there to be stroked. As every rabbit knows, choosing a good place to sit or have a nap can make the difference between a lot of petting and no petting at all. Our house rabbit Carolina likes to stretch out in a doorway or the middle of the corridor so we have to pay her attention when we walk past. When I have a bath, she waits for me outside the door to get more petting. And at mealtimes she sits under my chair for extra cuddles. Presentation/Stretching Rabbits usually flatten themselves on the floor (and sometimes lick the carpet) when they want to be petted. Nudging/Pushing A rabbit may nudge your hand or leg or push his head under your hand to request cuddles. Standing up By standing on her back legs a rabbit makes herself more visible when she begs for food or attention. Licking Rabbits may lick your hands, feet or face when they want to be stroked. Licking is also used to encourage more petting after you stop. Circling Circling your feet can be a demand for food or attention. My rabbits never fail to do this when they want to be stroked or I’m within a foot of their treat cupboard. When I lie in on Sunday mornings, one of them keeps running around the bed until I get up. Looking A rabbit might catch your attention simply by staring at you. When our friends John and Suzanne watch television, their rabbit sits by the telly looking straight at them until one of them picks him up and gives him a cuddle. Lying down/Getting up No matter what she is doing (eating, playing, grooming) my rabbit Carolina will stop and lie down when I approach, ready to be cuddled. As soon as I finish stroking her she gets up to demand more petting. Lying close together Rabbits snuggle up to their favourite human and animal friends to request attention. Honking Oinking softly (often accompanied by circling) is a request for love or a treat. Muttering One of our rabbits “woofs” when I stop petting her to express disappointment and demand more cuddles. Thumping A rabbit may stamp the ground with a hind leg when he wants attention. Because thumping also indicates fear, be sure to check on your rabbit to see that he’s all right. Excessive thumping can become a habit which may be prevented by ignoring your rabbit (see Negative Attention-Seeking below). Tossing objects/Making noise A rabbit may throw things around, e.g. his rattle or food dish, to get noticed. Our foster bunnies run excitedly and make a lot of noise if their dinner is late. Pawing/Digging Rabbits sometimes paw at your bed/feet, etc. for attention. Pulling/Chewing on clothes These are signs that the rabbit needs attention. One of our rabbits will tug on my trouser leg or play with my dress until I bend over to cuddle her. Usually she is very gentle and doesn’t damage the clothes, but once when I didn’t respond quickly enough she bit my shoelaces in half. Jumping Jumping in your lap or on your back may also be signs that your rabbit wants attention. Sitting on top of things Our foster rabbits tend to climb on their wooden tunnels and garden chairs when they want me to bring them indoors. Literary tastes A rabbit may grab the newspaper from your hands or sit on the book you’re reading when he wants affection. My own rabbit doesn’t normally chew on paper, but she will resort to that if her needs are ignored. Following from room to room Following you around is a sign of affection and also that your rabbit wants to be noticed. Help with housework, gardening, etc. 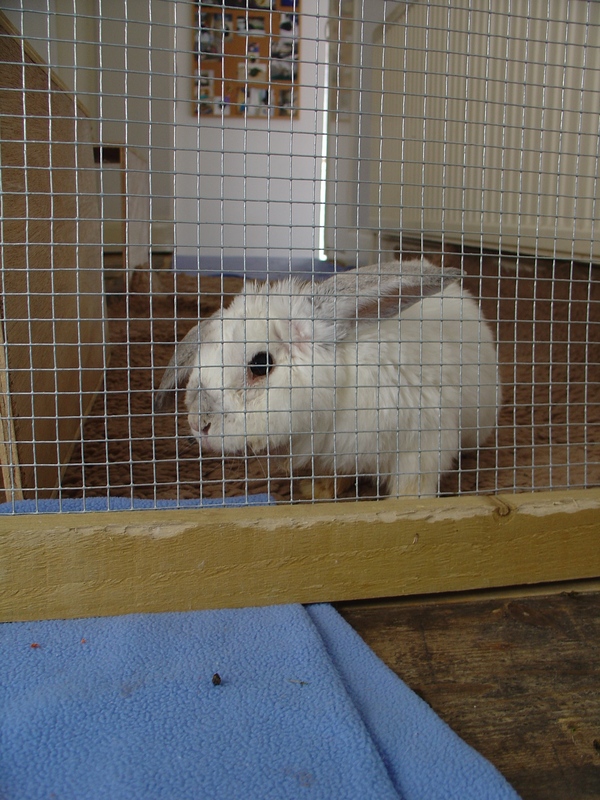 Rabbits like to take part in activities that take place at floor level, e.g. cleaning, gardening, playing board games. This is both curiosity and a desire to become involved in what other people are doing. Urinating Occasionally a rabbit may urinate on the floor or sofa to draw attention to herself, for instance after being left alone all day, or when you stroke another rabbit. Destructive behaviour Chewing on doorframes or wallpaper can also be requests for attention. Make sure your rabbit gets enough company/exercise, and has plenty of toys to keep her occupied. Sometimes you may have to ignore your rabbit to discourage negative behaviour. Our foster rabbits used to shake the baby gate day and night to get attention until we decided to let them be and within days they all stopped doing it. Biting A rabbit may nip you to demand that you pet him. As with destructive behaviour, you should avoid responding or he will soon learn to associate biting with being rewarded. Let out a short screech whenever your rabbit bites you. Gradually his nips will become gentler and more acceptable ways of communicating. For the past two years, a certain somebody has had me wrapped around her finger. Sorry, that should be paw, as that somebody is LuLu, my four year old dutch dwarf. I have so many stories to tell, I don’t know where to start. I guess the first story I should tell is “Jealousy”. Before LuLu received her own room, she spent most of her time in our bedroom. It was a place to call her own, and she did! One of the first things I do, when I get up, come home, etc., is get down on the floor and say hi to LuLu. One night, after working late, I came home, sat on the edge of the bed and started to talk to my fiancee. After about two minutes of conversation, from under the bed came a loud THUMP. We just laughed it off and continued talking. A few minutes later that thunderous THUMP sounded again. This time, from on top of the bed, I asked in that baby talk we all use with our bunnies. “What za matter LuLu?” Of course her answer was, “THUMP”. This time, I went down on the floor, and asked the question once again. She ran out from under the bed and greeted me like she does every day. After a few minutes with LuLu, I went back to our conversation, and everything was fine. I ask myself, was she jealous that I did not say “Hi” to her first? Knowing LuLu, I think so, what do you think?